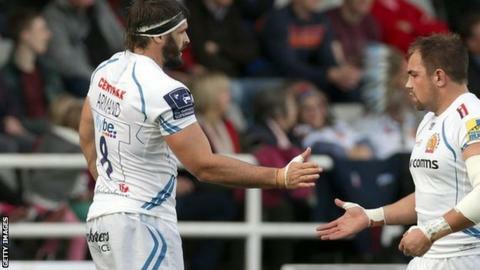 Exeter sealed a comprehensive bonus-point victory over Newcastle, who are without a point this season. Falcons' only points came from Mike Delany's penalty to put them 3-0 up. Chiefs scored five first-half tries through Will Chudley, Julian Salvi, Matt Jess and two from Don Armand, with three Gareth Steenson conversions. Moray Low crossed for try number six, with Steenson sending over the extras, as well as a last-minute penalty to add gloss to a comfortable victory. The results saw Exeter claim their second victory of the new season, while Newcastle have now lost all three matches. The first half was as one-sided as they come, with the visitors earning their four-try bonus point inside 32 minutes, before adding one more on the stroke of half-time. An early Delany penalty was all Falcons fans had to cheer about - with Chudley finishing off his own charge down, Salvi's first try for his new club, Armand bundling over off the back of a ruck, Jess' effort on his 100th Premiership appearance and a second for Exeter's big number eight compounding Newcastle's misery. Falcons wasted several opportunities to reduce the deficit, and the sixth Chiefs try came after Low bundled over for his first-ever top-flight score, with Steenson converting and sending over a late penalty. "We will sit down and dissect things later. We knew what Exeter would do and we couldn't stop them doing it. "We did have three outstanding chances in the second half but, in the nature of the day, nothing really went our way - but that's down to us. "We have to look at our defence, which was appalling. There's bound to be some finger-pointing but we have no one to blame but ourselves. "We didn't score a try today, which is disappointing and there were a few positives but it's the small things that make a difference and we're doing the small things really badly." "Not making the top four last last season on points difference has had an effect on us. It's given us a nice, hard edge and I like that, so no apologies. "We were very clinical in the first half, scored some good tries, put pressure on their kickers and in the scrum. "We spoke at half-time about not giving away any penalties and, in the second half, we gave away only one and I have to take my hat off to the lads for that." Newcastle: Hammersley; Tait, Penny, Powell, Venditti; Delany, Young; Fry, Lawson, Welsh, Botha, Green, Welch (capt), Latu, Hogg. Replacements: McGuigan, Vickers, Vea, Furno, Clever, Tipuna, Catterick, Agulla. Exeter: Dollman; Jess, Slade, Hill, Short; Steenson (capt), Chudley; Moon, Cowan-Dickie, Francis, Lees, Welch, Ewers, Salvi, Armand. Replacements: Yeandle, Hepburn, Low, Atkins, Waldrom, Lewis, Whitten, Woodburn.